Anzula is bringing a friend to Stitches West! Prizes from Anzula, Lorna’s Laces, Purl Soho, Yarnover Truck and more! Join The National NeedleArts Association (TNNA) for the 2019 Winter NeedleArts Market in Portland, Oregon, taking place January 31 – February 3. The TNNA Winter Market is the perfect place for needlearts professionals to meet, engage, learn and shop! The show brings together individuals from the across the industry for three days of technical and business education, continuous networking, insights into the latest trends and access to must-have products and face-time with exhibitors at this more intimate market. 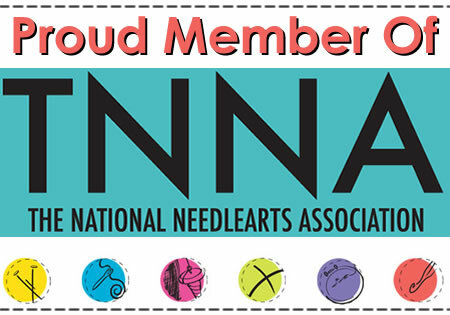 Visit the TNNA website to learn more about the TNNA 2019 Winter NeedleArts Market and register now for the event. We look forward to seeing you in Portland! Yarn del Sol is getting a huge Anzula Trunk Show! Join us for an amazing day of art, crafts, live painting demos, factory tours, meeting the artists, live dance performances, yummy food, knitting, crocheting, weaving, spinning, and more! Parking: There is tons of street parking on Blackstone on Saturdays. Street parking less than one block away on Englewood. Meet the artists: Muralists Josh Wigger, Maruo Carrere, and Robert Amador who painted all the murals at Anzula. Check out more of their work on Instagram. Creative Fresno - Free interactive art project for all ages! We are so excited to see all of you and show you our new place! Join us at Swatches for some yarnie fun to celebrate their 10th Anniversary! Charlie will be there with lots of yarn, including some extra special one of a kind skeins. Sabrina's coming back through Kentucky to visit ReBelle and she's got all the yarn for you! Come snuggle, squishy, and get to know our lovely and luxurious Anzula yarn. She's only there for 2 hours, so grab what you can! Sabrina is so excited to be having another trunk show at Knotted Needle! If you've missed it before, you won't want to miss it this time! She'll only be there for 3 hours, so be sure to get there and get some yarn before she packs it all up! Crafty Lady Trio is hosting another Anzula Trunk Show! Sabrina will be there with all our soft and luxurious Anzula yarn, tucked away in our vintage suitcases. It's only for 2 hours, so you won't want to miss it! Anzula is coming to Spun! We've snuggled our soft and squishy yarns safe in their vintage suitcases especially for this event. Come adopt your own skein (or skeins, we don't judge!) of Anzula yarn. Be sure to stop by, you won't want to miss it! Anzula is back! Harps & Thistles is hosting another fantastic trunk show and Sabrina is bringing all our soft and luxurious yarn! It will only be for two hours, so be sure to stop by and take home a skein or two (or ten)! Gosh Yarn It! Anzula is coming to Yarn It & Haberdashery for a two-hour trunk show and Sabrina is bringing all the Anzula yarns! Be sure to stop by! Knitting Off Broadway is hosting another Anzula trunk show, and we're excited! Sabrina will have all of our delicious Anzula yarn with her for 2 hours only, so don't drop the (yarn) ball! Get there while you can! Anzula is coming to Knitorious! We've snuggled our soft and squishy yarns safe in their vintage suitcases especially for this event. Come adopt your own skein (or skeins, we don't judge!) of Anzula yarn. Be sure to stop by, you won't want to miss it! The Yarn Store at Nobhill is hosting their very first trunk show with Anzula! Sabrina will be there with all our wonderful Anzula yarns tucked away in our vintage suitcases. She's only there for 3 hours, so don't miss it! Jessica Knits will be hosting another Anzula Takeover! Sabrina will be there with all our vintage suitcases stuffed full of our yummy Anzula yarn. But she'll only be there for a 2-hour trunk show, so you won't want to miss her before she's gone! Next stop, Fiber Creek! Sabrina will be there with all our yummy Anzula yarn for two hours only, so don't miss it! Sabrina is headed to The Spinster and she's bringing all our lovely Anzula yarn with her! She only there for two short hours, so be sure to stop by! Twisted Skein is hosting their very first trunk show! Sabrina will be there for 2 whole hours will all the lovely Anzula yarn. Stop by and get some before she's gone! Head to your Local Yarn Store for and awesome day filled with treats, exclusive kits and goodies, knitting, crochet, weaving, spinning and all the yarn-y wonderfulness! Anzula Kits are available exclusively in Local Yarn Stores. See where you can find each kit by clicking the photos! Have you been to an Anzula Takeover before? Come to Knitique and check it out! Sabrina will be bringing all of our lovely Anzula yarn in their cute vintage suitcases. Stop by and take some yarn home with you! Anzula is back! A Yarn Less Raveled is hosting another fantastic trunk show and Sabrina is bringing all our soft and luxurious yarn! It will only be for two hours, so be sure to stop by and take home a skein or two (or ten)! Have you been to an Anzula Takeover before? Sabrina will be at Green Planet Yarn with all of our wonderful Anzula yarn packed away in vintage suitcases! Come snuggle, squish, and take home your very own Anzula! Circle of Stitches is hosting a huge Anzula Trunk Show with lots of Cricket, Silken and Breeze! Stop by and grab a skein (or 5)! Yarn del Sol is getting a huge Anzula Trunk Show with Cricket, Lucero, Nebula, and Gerty!